I don’t recall ever being as eager for spring to arrive as I have this year. It’s not just the warm temperatures that I’m waiting for, it’s also the blue skies, the chirping birds, the flowers and even the spring cleaning. I love that first warm day when you can throw open the windows and let the fresh air flow in. I find it motivating to get the house in tip top shape. For me, spring is a time for purging those things that we no longer use or need. I also give my family a fresh start and rearrange the furniture in the spring, mostly because I need a change at least once a year. Lastly, spring is a time for giving everything a quick wipe down to get rid of the dust from months of running a furnace. I recruit my kids to help with this. I give them each their own roll of paper towels and a spray bottle and they get to it. They still believe it’s fun to spray and wipe and that definitely works in my favour! The new Royale Tiger Towel is perfect for spring cleaning. It’s strong so it can handle the tougher cleaning jobs like our patio chairs that were outside all year (oops!) and they are really absorbent for cleaning up spills. I am fine with my children using Royale Tiger Towels because they are dye and fragrance-free, and I like that they come in half sheets. They are the right tool for our spring cleaning. The newest member of the Royale feline family has come roaring into the Canadian market with Tiger Towel, a soft, strong and thirsty multipurpose paper towel. Prowling the shelves of retailers across the country, Royale has partnered with Pathera, the world’s leading wild cat conservation organization, which works in partnership with Save the Tiger Fund to conserve the world’s remaining 3,200 wild tigers. As a proud partner, Royale will donate $40,000 to the fund as well as provide ongoing support to raise awareness and increase fundraising efforts throughout 2014. 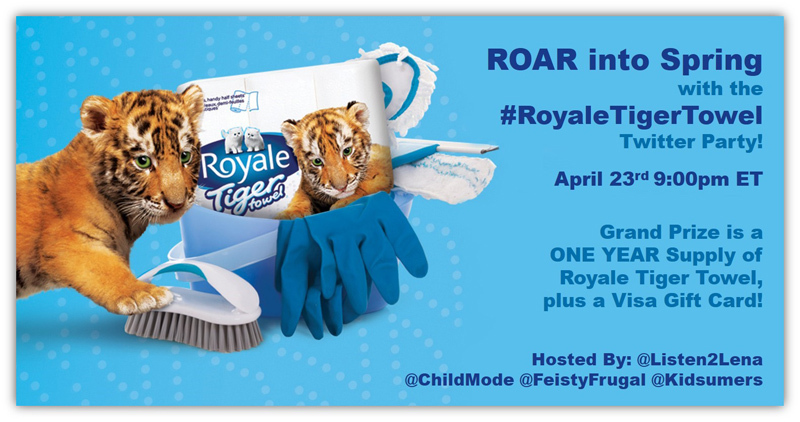 Join us for the ROAR Into Spring with #RoyaleTigerTowel Twitter Party! RSVP below with your twitter handle (eg. @kidsumers). You must RSVP to be eligible to win. Looking forward to this party thank you so much. I love the new Tiger towels. It would be a blessing to win a year’s worth! this would be nice to win a whole years worth of towels, it sure would help cleaning up after 4 pets and a husband!! I’ll definitely try to make it! I love a good twitter party! I got it on the calendar. I look forward to chatting. I’ll try to make it, these would be really handy! I have another twitter party to host at this exact time. What a total bummer! I have seen these actually and I am very interested! I will see you there provided I don;t fall asleep early. So tired.